After spending the time putting in all the sets, kills, digs, etc. 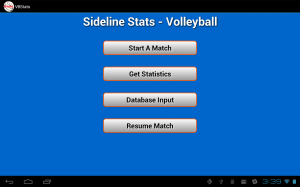 associated with a volleyball match, you would like to see the resulting statistic of your team. Sideline Statistic show this data in various ways, by players, by rotation, by opponent, by game, and by rotation/player over various period of time (season, match, etc). In order to get access to these statistical displays, from the main menu press the ‘Get Statistics’ button. The button is only displayed when there is statistical data available from any match, whether it was completed or not. The statistical panel opens with the default of the team’s statistics over the current season by player. Above the statistical display are two buttons that allow you to select how the report should be broken down and the interval that should be used for the report. The ‘Breakdown By’ button shows the current breakdown used for the report, as well as, the ‘Interval By’ button shows the current interval used. By depressing either button, you can change the breakdown or interval respectively. The ‘Breakdown By’ button presents the categories currently supported by the program. 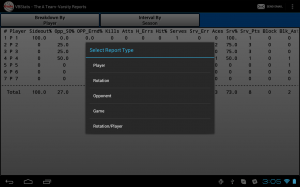 ‘Player’ is the default breakdown type, The report will contain all players that had any activity on the court over the period selected. Players that had no court time, are not shown . The ‘Rotation’ breakdown provides statistics based on rotational position. This report is very useful if players always play a given position with a rotation. This report will show week and strong rotational positions. The ‘Opponent’ breakdown will show how the team performs against an opponent that has been played in the past. The ‘Game’ breakdown shows the statistics for each individual game over the interval period. The ‘Interval By’ button presents the intervals that the report should span. The default interval is ‘Season’. Season is determined by the time the team was created within the program to the current day. NOTE:It is suggested that new teams be created at the start of a season in order to get a true season report. ‘Match’ interval represents a single match played. When selected, a second dialog is presented that allows you to select which match the report should cover. The ‘Date Range’ is self descriptive. The user inputs a start date and end date over which the report should span. 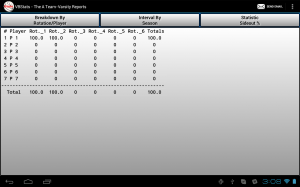 ‘Custom Matches’ allows one to select various match for which the report should include. The last report type “rotation/player” shows the statistic for a particular player in a particular playing rotational position. For this report a third button is presented along with the ‘Breakdown By’ and ‘Interval By’ buttons. With this button you can select which statistic is to be provided for the rotation/player report. For all reports, a Menu option is provided to email any report. 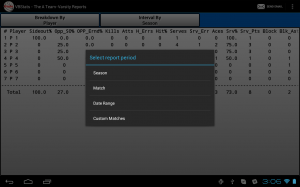 For reports that are by Player for a particular match the email option provides a second option to either send the report in text format or to send a file formatted in “Max Preps” format.